When needing to search for evidence at a crime scene, or perform emergency first aid, latex gloves are absolutely necessary to prevent contamination. The compact and portable Sentinel Nylon Double Latex Glove Holder from Uncle Mike's Sentinel Duty Gear line attaches securely to duty belts, ensuring that a pair of protective gloves is always close at hand. The pouch is constructed from tough, molded foam with an abrasion-resistant ballistic nylon outer shell, ensuring a high level of security and weather-resistance. 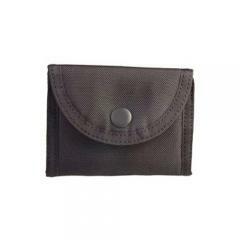 The design includes a top flap with a convenient snap closure for additional security and retention of contents.